Making great looking cakes takes a lot of practice. I don’t have any artistic abilities at all but that doesn’t mean I won’t give it my best shot. You see, when it comes to making someone feel special on their special day, I try my best to pull out all the stops. My French Vanilla Cake With Raspberry Cream Filling And A Mascarpone Buttercream Frosting is semi-homemade but I’m sure proud of the job I did. I start out my favorite box mix and build from there. To not get overwhelmed in the whole process, I take 3 days to make the cake. I do this in 4 stages. That way it becomes like a science project you had to do back in school. When it’s finished and you present the cake, there’s nothing better than seeing the absolute joy on their face. This is an offset spatula. It’s a great tool for frosting and available in different sizes. Note: Make sure all the ingredients used for batter and frosting are at room temperature. Examples: eggs, ricotta, mascarpone cheese, butter. Equipment: parchment paper, electric mixer, 3 graduating cake pans, 4″, 6″, and 8″, 3 round cardboard cake dividers matching the size of the cakes, ( these will be placed between each cake for support).A cake slicer, or a long serrated knife, offset spatula, a cake stand or a cardboard cake base, 2 bowls, 1 medium-size, and 1 large, cooling racks. 12 ounces of good white chocolate (8 ounces melted for curls and shavings, 4 ounces grated). Prepare the pans with parchment paper, butter and flour. Using a semi-soft stick of unsalted butter, completely grease all the pans on the bottom and along the sides. Next, place a round piece of parchment paper in the bottom of each pan. Rub butter on top of the parchment paper as well. Then dust those same three pans with all-purpose flour. shake off any of the excess Set the pans aside and start making the batter. Start one at a time of the three boxes of French vanilla cake mix. Note: Make sure all the ingredients are at room temperature. In a large bowl mix together the wet ingredients listed on the back of the box. The eggs, vegetable oil, and water. To that, add a 1/3 of the caviar from a vanilla bean pod, and 1/4 cup of ricotta cheese. Whisk these ingredients together with an electric mixer, on low speed, until well combined and smooth. Next, still using the electric mixer on low speed, add the dry mix from the box slowly to the wet ingredients. Once the dry and wet come together, immediately remove the mixer and transfer the cake batter to the large bowl, small lumps are fine. Make sure to use a spatula to get all the batter out of the bowl. Repeat this process, two more times, using the same bowl. Each time transferring the batter to the large bowl. At this point, all the batter has been mixed and is together in the large bowl. Using the spatula, give the batter a big stir one final time. Fill each of the cake pans 2″ from the top. Gently, tap each of the pans on the counter to release any air bubbles that may be trapped. Follow the temperature instructions on the back of the cake box. Because there are three different size pans, baking times will vary. The small cake should take about 45 minutes. the medium pan 55 minutes, and the large pan about 60 to 65 minutes. Use a cake tester or a wooden skewer to check on them at these particular times to make sure each cake is fully baked. You know if it’s done when the skewer comes out clean. Each oven may vary so keep a close eye on the time once the cakes are placed in the oven. As each cake finishes baking, remove that one from the oven and place on a cooling rack. Once all the cakes have come out of the oven. Transfer the three cakes to cooling racks and allow to cool for 30 minutes. Then use a knife to loosen the cake around the edges of the pan. Place the cooling rack on top of the pan then invert the whole pan rack included upside down. Lift the cake pan slowly to allow the cake to fall free from the pan. Repeat this process for each cake. Let the cakes cool completely before frosting. In a sauce pot, place 1 pint ( or 2 half pints) of fresh raspberries, granulated sugar, Chambord, (raspberry liqueur), raspberry jam ( with seeds) and water. Turn on medium heat. Bring the raspberries up to a soft boil, reduce the heat, turn down to a simmer. Using a fork, mash the raspberries to break them up completely. In a small bowl, mix 1 heaping tablespoon of cornstarch with a tablespoon of water. Add the cornstarch mixture to the sauce and bring the mixture back up to a boil, (adjusting the heat) stirring continuously. Once the sauce has thickened, about 7-10 minutes, remove from the heat, transfer to a bowl and let cool completely. To the cooled raspberry sauce, add 1-8 ounce container of room temperature mascarpone cheese, 1/2 cup of powdered sugar, and 1 tablespoon of pure vanilla extract. Mix all this together, cover with plastic wrap, and place in the refrigerator for at least 4 hours. Remove each cake from their pan and the parchment paper from the underside of each cake. Once at a time, slice through the center, lengthwise, of each of the cakes. Take the filling and spread the raspberry cream on the bottom half of each cake. Make sure not to spread it all the way to the edges. Leave about 2 inches around the outside of the cake. Place the top back on each cake. First, start by setting parchment paper on the main base to prevent frosting from getting all over. You want to set the parchment so you can easily pull the piece out once the cake has been frosted. Set the larger cake, carefully centered on top of the parchment paper that’s resting on the cardboard cake base. Next, place the cardboard rounds in between each of the filled cakes, stacking the cakes carefully, and centered, on top of each other. In a large bowl add 4 sticks of room temperature unsalted, 3 8-ounce room temperature containers of Mascarpone cheese, the zest of 1 lemon, 2 tablespoons of pure vanilla extract, 1 tablespoon of cream cheese emulsion. Using an electric mixer or stand, with the paddle attachment, on low speed, mix these ingredients together. Slowly, add the remainder of the 2-pound bag of powder sugar. Mix all this together until completely combined and smooth. This cake, I used decorative pieces fresh raspberries, and white chocolate to decorate this cake. In an earlier post, under I talk about a bakery supply company called D & G Occasions. This is where I purchased all the decorations for this cake. You can visit D & G Occasions by clicking the link at the bottom of this post. Using an offset spatula, starting with the top and working downwards and around the outside of each particular cake. Once the cake is totally frosted, fill a large pitcher with super hot water. Dip the offset spatula in the water, shake off the excess water. Run the spatula around the top and rim of the bottom two cakes as well as the outside of each cake. This will smooth out any imperfections on the frosting. If needed, add more frosting to areas that made need it. Again, smoothing it out by using the offset spatula that’s been dipped into the hot water. Whatever decorations you may choose to use, let your imagination run wild. I used a large gum paste red rose for the top and small red sugar roses as a border around the base. Red covered chocolate candies as accents, and a border of fresh raspberries around the middle layer of the cake. Melt 8 ounces of white chocolate, in the microwave, in 30-second intervals, until just melted. Pour the chocolate onto the bottom of a baking sheet, and place that into the frig to set. Take a small metal cookie spatula and run that along the cooled chocolate making chocolate curls and shavings. Using a grater, grate another piece of white chocolate over the top of each layer, so it falls like snow all over the cake. There you have it, French Vanilla Cake With Raspberry Cream Filling And Mascarpone Buttercream Frosting. Who doesn’t love a great milk shake, and I don’t mean the healthy smoothie version. I just mean a your every day milk shake, but with a twist. 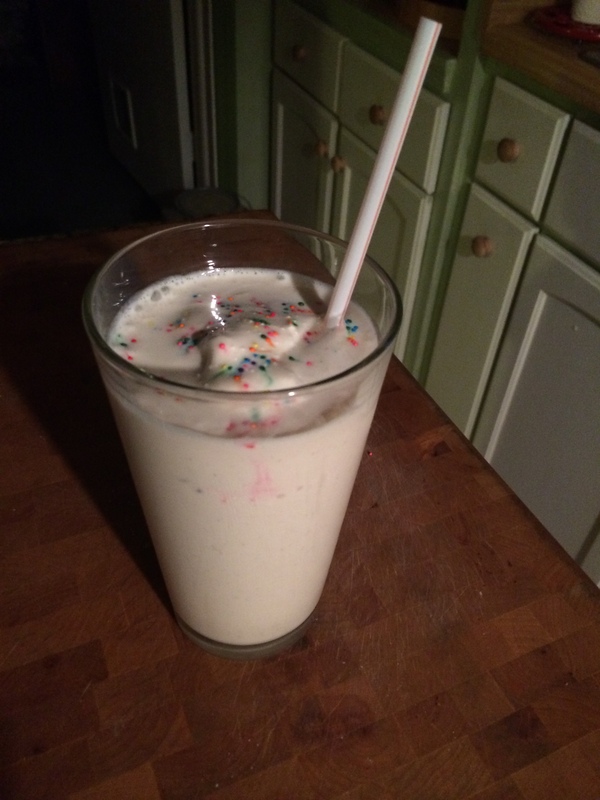 I was watching “The Chew” last week and they came up with a birthday cake shake. Crazy right? So don’t you know I got my blender out, grabbed one pint of my favorite vanilla bean gelato out of the freezer, 1/2 a cup of milk or so, and a 1/4 cup of my favorite box cake mix, “French Vanilla”. I do love me some vanilla. So I put everything in the blender starting with the gelato, then the cake mix and finally the milk. I like a really thick shake to there is room for adjustments on the milk. Turned the blender on a gave it a whirl. Poured that bad boy in a tall glass, added some colored sprinkles and a straw. The little girl in me came right out. I have to say that you can get crazy with this idea. Top the shake with whipped cream, or even pipe on your favorite cake frosting then add the sprinkles.Yum!… All good things in moderation.